Iphoto is an internet picture downloader to download pictures, photos, images, JPG, GIF from web or internet. It can access your favorite web sites with a maximum of 8 threads simultaneously. 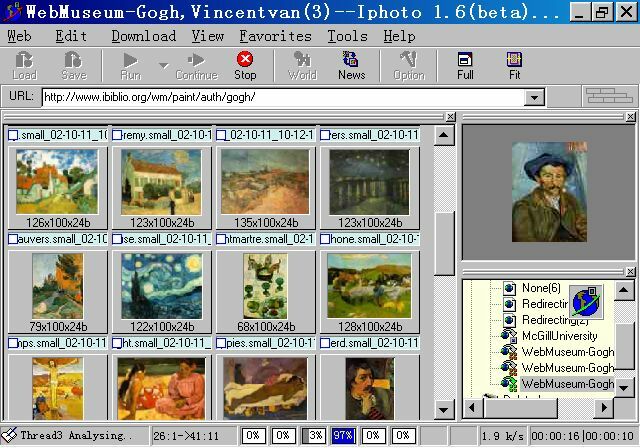 It analyzes the structure of the web site, finds the pictures and photos (JPG,GIF) and downloads them to your hard disk. It makes the picture download a fun task to do. Enjoy your download picture journey with Iphoto! Automatically keep a record of where digital photos were taken. A combination of IphotoDVD, iMpeg Converter and DVDBuilder. Qweas is providing links to Iphoto 1.9 build36 as a courtesy, and makes no representations regarding Iphoto or any other applications or any information related thereto. Any questions, complaints or claims regarding this application Iphoto 1.9 build36 must be directed to the appropriate software vendor. You may click the publisher link of Iphoto on the top of this page to get more details about the vendor.